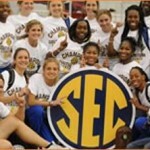 Florida Gators women’s basketball (1-1) hosted the No. 13/10 Florida State Seminoles (2-0) at the Stephen C. O’Connell Center Tuesday evening, dropping a heartbreaker 66-62. The Gators, who were attempting to upset the ranked Seminoles, took the lead 62-60 with 2:04 remaining but would not score another point as FSU would regain control with 37.4 second left on the clock. Florida senior forward Sharielle Smith recorded 18 points and 13 rebounds for her fourth career double-double in the contest. Up next for the Gators is a trip to Pittsburgh, PA, on Friday to face the No. 25 Pittsburgh Panthers at 7 p.m. It is the team’s first road game of the season.